Lets take a moment to talk about development tools. Three software pieces are needed to make a PIC IC do something. First we need an editor for writing the Code. These editors are called IDEs ( Integrated Development environments ). There is no reason why one can’t use Notepad or Vi for writing their code, however having an IDE is a lot better because things get color coded, errors in the code are easily spotted, and various tools for debugging and testing are also there. 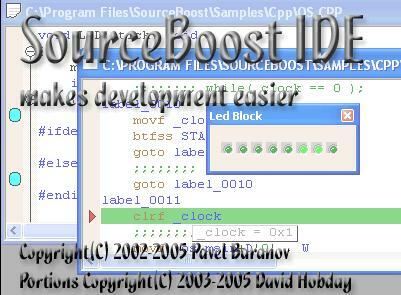 Some IDEs are quite pricey, but the one I chose to use is a very nice free one called SourceBoost IDE. The second piece is the compiler/linker this step takes the Code written in a language of choice like Basic, C, or Assembly and converts it to HEX format that the PIC can understand and execute. The compiler I used is PicC-Lite and it is available totally free from HI-TECH software. The 16F627 is supported by the compiler, however some other variations may not be. The final piece of software is the program transfer utility. The VM111 board comes with a ProgPic2.exe in the box and others are available. The software installation does not have to be done in a specific order but loading the VM111 kit software, then PICClite, and finally SourceBoost IDE should make things easier. Windows XP, 2000, and 98 will all work the same and a true Serial port needed for programming because USB to Serial will not work with this kit.